July 31, 2014 May 2, 2015 by Beau H.
Editor’s note: Building great style on a budget can be difficult and expensive. This is the seventh part in an occasional series chronicling great locations to start a wardrobe and buy affordable, good-looking style staples. Past entries have chronicled places like Banana Republic, Target and Express. Check out the full set of six posts in the series here . When starting out reinventing your personal style, there are certain incremental steps along the way. And even for those of us who’ve worked at our style for a while (doing things like embracing fit, paying attention to small details, and reaching for timeless style essentials), there’s always opportunity to improve and mix things up. One of the easiest ways to do this in a relatively quick manner is turning toward a new brand. While some brands offer tried-and-true basics for almost everyone, the great thing about the world of men’s style is the amount of versatility and limitless variety out there, both from domestic and international brands. Owned by Polo Ralph Lauren, yet decidedly different. In that regard, Club Monaco is a brand that shakes up the traditional #menswear fornula just enough, providing the ideal opportunity to explore new styles and items at decent prices (for the most part). They have a more continental vibe than J. Crew, they have more variety than a basics outpost like Old Navy, and although some styles are zany, they don’t stray into full-on Urban Outfitters territory. They’ve been owned by Polo Ralph Lauren for about 15 years, but the brand seems to occupy its own space, something reflected in its clothing offerings. The brand itself is a hybrid of sorts — a mix of tailored wear with unique touches, and casual stylings that are just different enough from typical tried-and-true offerings. 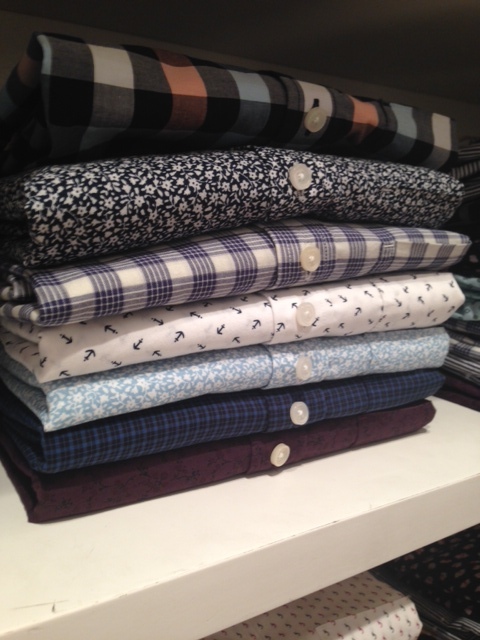 Some of the brand’s washed casual shirt offerings. The first noticeable thing about any Club Monaco outpost is the variety — spread throughout the store and within each individual section. Think heathered T-shirts next to sneakers, with casual washed blazers just a few steps away. It’s arranged in a pleasing manner that flows naturally, something that could be disastrous if done wrong. 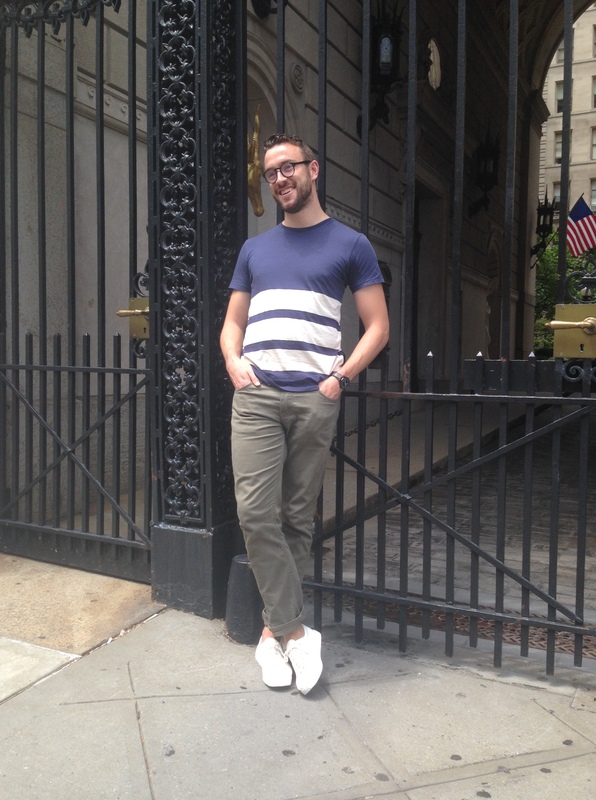 Stripes, small prints and casual washes — the Club Monaco basics formula. 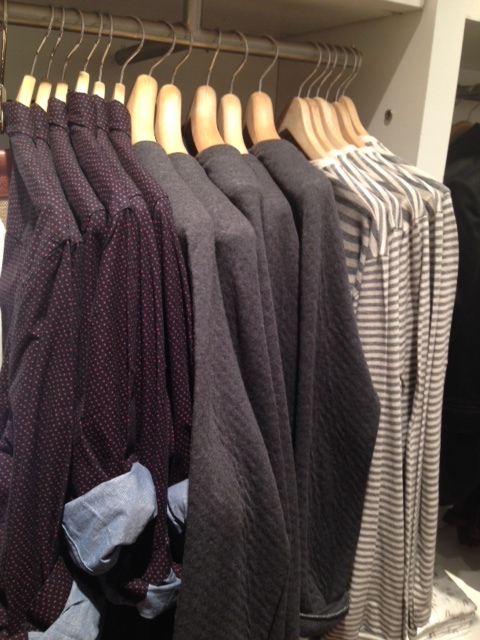 Club Monaco seems to emphasize variety in color as well, but again, in a pleasing manner. Its T-shirts, shorts and polos aren’t highlighter-bright and plastered in logos (looking at you, Express). Instead, there’s a nice mix of washed shirts, pocket tees and striped long-sleeve and short-sleeve offerings in neutral colors, none of which would look of place on its own or layered in mostly any season. Again, a basic grey T-shirt suddenly doesn’t look so basic when combined with a heathered wash, for example. The one area where certain casual offerings don’t jump out that prominently would be denim — the jean selection in-store (at least in this particular shop) isn’t extensive when compared to other brands. On the other hand, chinos receive slightly more prominent displays (a good choice considering the continental aura with many of their styles). Peak lapels help this suit stand out from other, more plain suiting options. And the brand’s tailored wear is a strong point, too. The fits and stylings are more conservative than ultra-tight offerings from H&M or another retailer, yet they’re still trim and polished. The requisite variety in the suiting game is there too — heightened blues, glenplaids and checks, mixed in with peak and notch lapels. The suit above is a nice example of the typical variety taken in an approach by Club Monaco — changing up the traditional navy suit by adding peak lapels and a ticket pocket to the jacket. The price point is where some might find issue, however. 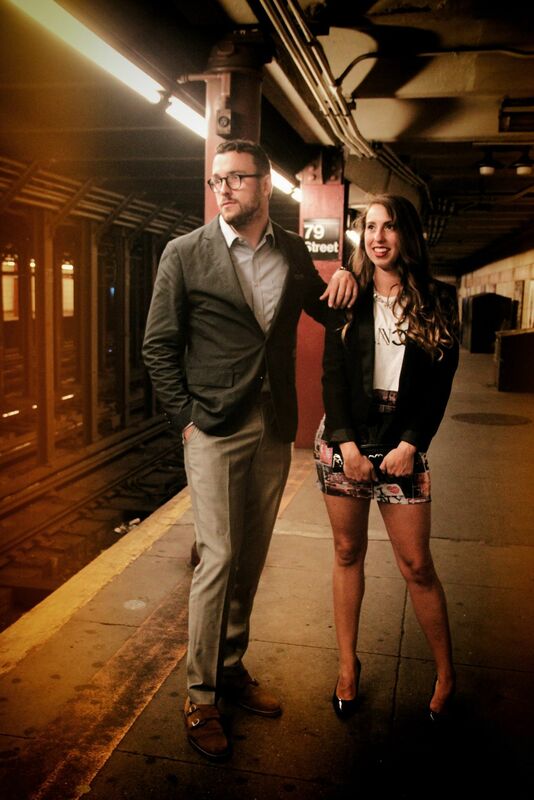 $525 for a cotton suit jacket seems a bit steep when compared to a jacket from J. Crew’s famed Ludlow suit ($358). And while there’s no denying the quality of the Ludlow suit, Club Monaco doesn’t seem to get as much play when it comes to well-dressed guys suiting up. A deep (and artfully-arranged) array of shoes from menswear favorites. But, moving through Club Monaco yields some high-quality finds in the shoe department. 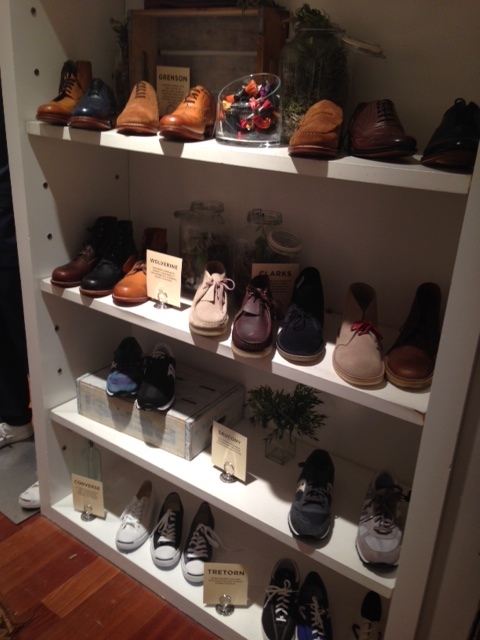 The brand has partnerships with noted #menswear favorites Wolverine, Grenson, Clarks, and Tretorn. That’s a pretty hefty lineup of heavy-hitters, which brings great variety to the brand’s lineup, especially in-store. 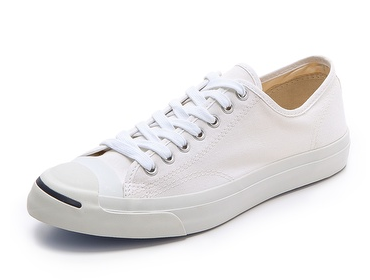 The quality of the shoes is just as good as going through the brand directly (take these Tretorn sneakers, for example) And the prices via Club Monaco for some shoes, like a pair of Grenson brogues, are significantly lower than the UK site itself ($380 vs. $450). The brand’s ties are, like the rest of the store, just different enough — neither too silky-smooth or plain, there’s a nice mix of current lightweight summer fabrics, like cotton and chambray, next to toned-down silk offerings (seen below). 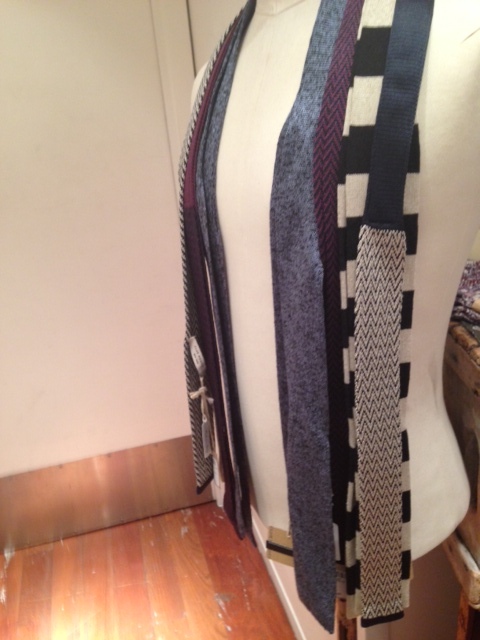 A mix of ties in woven knit and summerweight ties, along with traditional silk. The standout attribute about Club Monaco is the way in which the brand takes traditional favorites, like a standard T-shirt, and slims down the fit, changes up the wash and injects it with some new life. 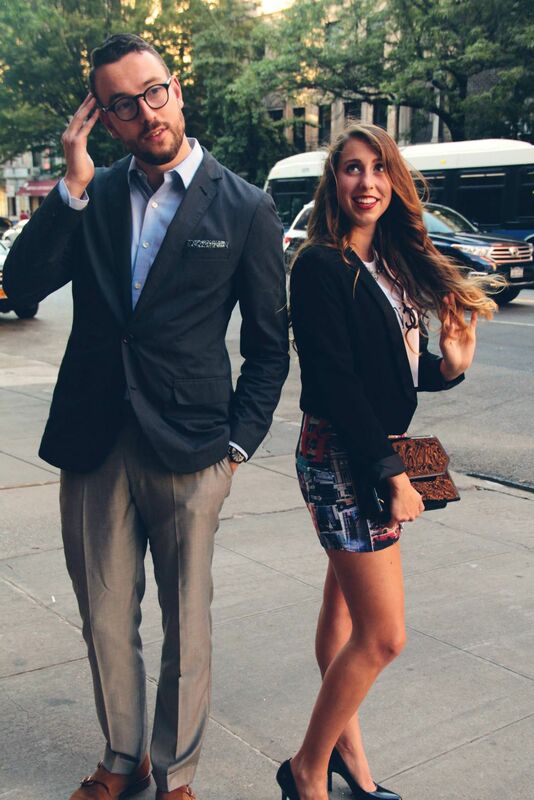 The same applies to their suits (with features like peak lapels and slight textural differences) and shoes (sneakers with some variety versus traditional low-tops, for example). While their prices are above that of J. Crew in some respects (as high as some of us might go when paying full-price), the return on the investment, particularly when it comes to sharp footwear and quality basics, appears to be worth it. 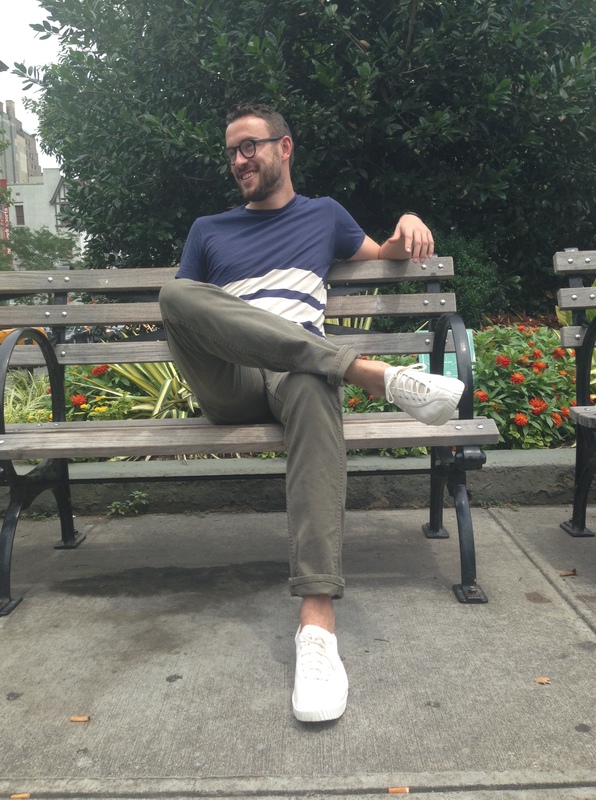 July 18, 2014 June 2, 2015 by Beau H.
Nothing beats a crisp, casual sneaker in the summer. Especially when days are hot, the ground is free of crazy winter weather, and you’re in need of something cool on your feet, few things are more ideal than the right canvas sneaker. While styles like the Converse Jack Purcell are plentiful in many places (as well as classic), sometimes it’s nice to change things up a bit. Particularly in the past few years, we’ve seen the classic white sneaker get a high-fashion upgrade, popping up outside runway shows and on menswear blogs with alarming regularity and with all different kinds of outfits. Now the great thing about the classic white sneaker is that you don’t have to drop hundreds of dollars to snag the perfect pair — variations and price points abound, especially in this category. In particular, Tretorn’s done a great job separating itself from the pack, and their Nylite Canvas Sneaker fits the definition of the ideal pair of crisp, white kicks — all for an astonishingly low price. 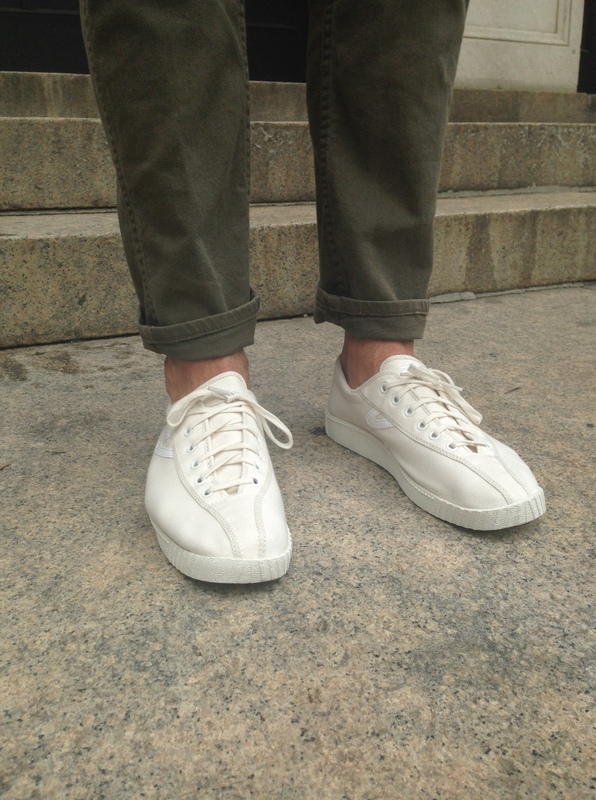 The breathable canvas exterior is surprisingly comfortable — perfect for a day walking around NYC. Watch by Stuhrling. While on a recent spin through the men’s section at Club Monaco (a fun trip all on its own), I stumbled across just the pair of shoes I’d been looking for this summer. Tretorn’s canvas sneakers have gotten a lot of play across the Web recently for their clean styling and versatility (for more on their other sneaker offerings, see this review from Dappered). And this pair certainly meets my expectations. The sneakers are incredibly lightweight and breathable, perfect for strolling around sans socks. Sneakers by Tretorn. Jeans by Levi’s. Holding up very well so far. For being a low-cut sneaker, they wear very comfortably — they don’t feel flimsy at all, unlike other types of ankle-high canvas sneakers. The solid rubber sole seems pretty durable, something you’d expect from a company that originally started making car tires. After three consecutive days of wear across the past weekend and into the week, the shoes have held up quite well. And surprisingly for being all-white, they seem to resist dirt and stains pretty well. Stylistically as well, these sneakers are on-point. Without the clutter of additional colors or lines, they’re totally streamlined. Unlike a higher-cut sneaker (like the ALDO Gia), these pair more naturally with cuffed chinos or jeans and without socks. And they add a casual, yet crisp, flair to other outfits, too. The sharp white color helps ground more outlandish prints, including that shirt in the link from Saturdays Surf NYC (a personal favorite). On top of their casual versatility (wearable with T-shirts, polos, printed short-sleeve shirts and shorts alike), these kicks could more than hold their own with something like an unstructured navy blazer (like this one seen here) and perhaps some light grey washed chinos and a heathered oatmeal henley. While that outfit might seem a bit odd at first thought, the surprising thing about a clean pair of white sneakers is the flair they lend to any outfit — sharp, and sophisticated … yet they’re still a sneaker — a nice sneaker, at that. When seeking out some new kicks, there’s no need to spend lavish amounts on a luxury brand. These Tretorn sneakers (and other ones in that range), are the ideal white sneaker for the price. 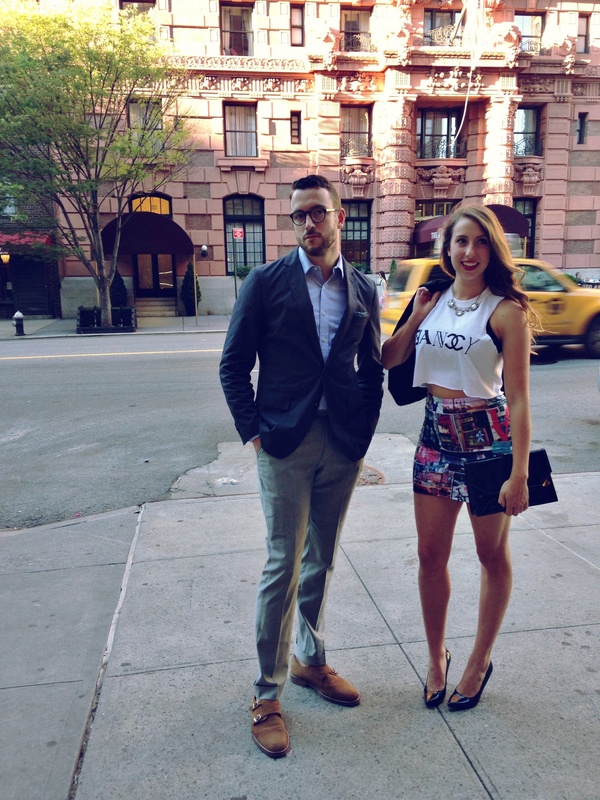 July 11, 2014 July 16, 2014 by Beau H.
The two minds behind Siblings With Style, Beau and Olivia Hayhoe, share their unique takes on stylish and sharp outfits for both guys and gals. For an evening out at the theatre in NYC (or any other ‘fancy’ event, for that matter), going for a look with some polish is somewhat expected — for men and women alike. In this particular instance, from a men’s fashion standpoint, it’s tough to beat a classic navy blazer, blue shirt and grey pants, but with some subtle, slightly different finishing touches. The blazer seen here from J. Crew has become a workhorse for me in the hotter spring and summer months, as it’s got a slightly different texture to it thanks to the cotton twill — which, along with the brown buttons, distinguishes it from a standard gold-button navy blazer. 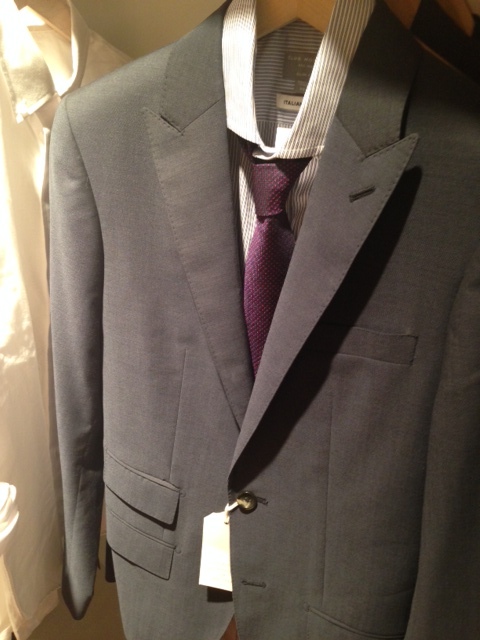 It’s also very lightweight and breaths well, and the lapels hit a personal sweet spot. So the blazer itself is just different enough. And although the blazer is navy, a light blue shirt (this one here is similar) works perfectly fine, as shades of blue definitely go together. The standout accessory of the top half of my outfit is the navy floral pocket square — yet another blue-on-blue accent. That variety of pocket square can’t be found on the site, but this one is close. On the bottom half of this outfit, light grey suit pants in an all-season weight are an ideal shade to pair with blue-on-blue accents, and the nice sheen on this particular pair dresses them up suitably next to a more casual washed blazer. As for footwear, mixing up the traditional confines of the blazer-and-pants combo can be done in just a few steps — as seen here with these suede double-monks from Banana Republic. Like the blazer, the double-monks are a warm-weather workhorse for me, pairing with everything from jeans and a pocket T-shirt to a slim polo and chinos for work days. A night out presented the ideal opportunity to break them out yet again. For ladies, the fashion possibilities for a theatre performance are endless, especially in NYC. Since I do not live in the city, I decided to go all out. Crop tops and tight skirts are very “in” right now– so I decided to play off that style. I bought a child’s size t-shirt from Joann’s and cut the sleeves off, and cut it shorter. As inspired by the song Fancy by Iggy Azalea (linked above), I designed in Photoshop a combination of letters from high-fashion brands and painted it on my crop top. I added a Betsey Johnson necklace to actually make it appear fancy. On top of that, I added a nice fitted blazer from H&M. This blazer has satin covered lapels, and looks similar to a men’s tuxedo jacket. One of my life mottos is “When life gives you New York patterned clothing, you take it and run”, and so I did. Last time I was in the city I wore my Times Square pants in Times Square, so it has become a tradition to buy everything that I find that is covered in a tacky New York pattern. I found this skirt for less than $10 at Ross. It was quite long before, so I shortened it. If you are looking for a skirt, dress, or pair of leggings in a fun pattern, try Black Milk. They are known for their high quality, fun designs. To finish my look, I stepped into a pair of black, patent leather, pointed toe heels from Nine West. I wear these shoes for business casual events, as well as out on the town because of their versatile look. I paired them with a patent leather clutch that I scored at Goodwill. Thank you to Teresa Kilzi for the awesome pictures! July 3, 2014 by Beau H.
With everyone’s favorite patriotic holiday quickly approaching, I’m sure you’re wondering what to wear (or at least, I assume you’re planning on wearing some form of clothing for the holiday!). Around special events like these, there’s always the option to wear things with a full-on Americana tilt. In situations like this however, there actually isn’t a ton of need to go all out and wear, for example, an actual American flag print pair of pants. Keep things simple, stylish and classic — as well as well-fitting. American-flag pants aside, that doesn’t mean you can’t have some fun with your outfit while still sticking to a patriotic color palette. 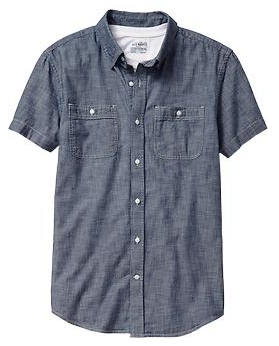 Chambray at an affordable price. This shirt knocks out the blue portion of the outfit right off the bat. Assuming it’ll be hot where you are on the 4th, or at the very least a pleasant temperature, a shirt with short sleeves loses the added bulk of a long-sleeve shirt. And if short sleeves get too chilly when the sun goes down and before the fireworks start, a lightweight cotton sweater or cardigan in a neutral color could be handy to have near you. The above option pictured above from Old Navy is inexpensive and (from personal experience), just the right quality for the price point — not paper-thin, not too heavy either. 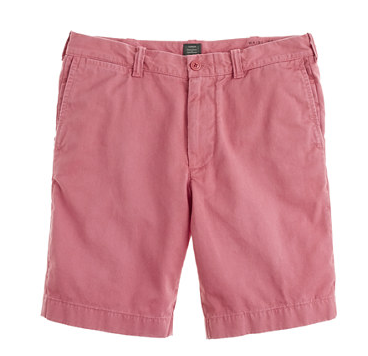 It’s also available in a lighter-color wash, in case you feel the need to lighten things up a bit. And perhaps most importantly, in an all-season fabric like chambray, this shirt is highly versatile (for more options on what to pair it with, see a recent post by yours truly on Effortless Gent). Directly on your lower half, we now see the red portion of the outfit. Without going full-on red, white and blue pants, a nice washed red shade will do the job nicely while losing the extra fabric of pants in the heat. In particular, these shorts from J. Crew have a stellar washed feel to them, without burning your eyes in terms of intense color. As with every other item in your closet, keep an eye on fit — the proper pair for your wardrobe should hit above the knee and fit trim (stay away from cargo shorts!). If your plans call for something more dressy and you’d like to keep going with red bottoms, reach for a washed chino in a similar color. (In the interest of full disclosure, I’m a PR intern with Bonobos — I can say without bias that their pants really do fit as well as advertised!). Conversely, if the situation calls for some dark denim, reach for a slim, inky blue pair like these. And here we have the white portion of the outfit. The key to keep in mind with this combination is that while it nods to the colors of the holiday, it doesn’t go overboard. Particularly, a subtle, classic canvas sneaker can be worn nearly anytime of the year, and so it just seems like a natural choice — especially in the heat of the summer. Additionally, it pairs equally well with colored shorts because of the stark white color, and it also wouldn’t look out of place with some cuffed denim or rolled chinos. If the bright white is too much, a simple grey pair could work, too. Keep in mind that the collared shirt up top helps you go more casual with your shoe choice. But, if it gets fancier on you and plans change, some polished-yet-casual loafers would be perfectly in order. And when going sockless with these shoes, keep in mind these tips about proper shoe (and foot) care. Although it’s assumed that your pants or shorts could most likely rest just fine without a belt based on proper fit, it’s always a nice fundamental touch to wear a belt (let’s say you get the urge to tuck in your shirt, or attend a gathering that’s a bit more dressed up). In the summer, keep things casual and don’t overdo it — avoid the shiny leather dress belt you might reach for with a suit, and go for something lighter-weight, like a cotton option with a hint of stretch. 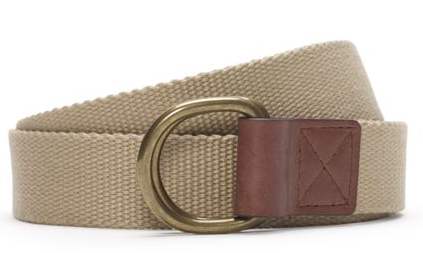 The above option from Club Monaco is decently priced, available in most sizes and, more importantly, epitomizes summer casual, especially with the D-ring loops. 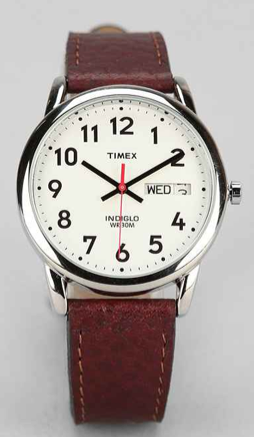 A clean and classic Timex. Adding in a watch can go one of two ways — if you stick with the largely casual version of this outfit and go with shorts and sneakers, something like a sturdy yet still-polished rubber strap watch could blend in perfectly with the rest of the casual outfit. And since the outfit and watch are both casual, there’s no need to worry about matching the black rubber strap to the leather on the belt. However, if you go with the dressier version of the outfit (denim or chinos and loafers), a stainless steel dive watch would be an excellent, versatile accent to the ensemble. Given the ability to go either way on this occasion, this Timex Easy Reader watch hits both points of the dressy spectrum. It’s well-made for the price point and can do almost anything, too. The leather strap is a go-between option to both dressy or casual outfits, yet the crisp, white face (with numerals) is sharp without being crazy minimal or too dressy. And although it wears somewhat smaller than some other brown-leather watches, it’s still an extremely valuable pick-up for the price point. The biggest key with this patriotic (yet simple) outfit is to nail fit on the shirt and shorts and keep the accessories relatively minimal and simple, while nodding to the colors of the holiday. More importantly, these are just clothes — the biggest thing is to enjoy the day and have fun spending time with loved ones!